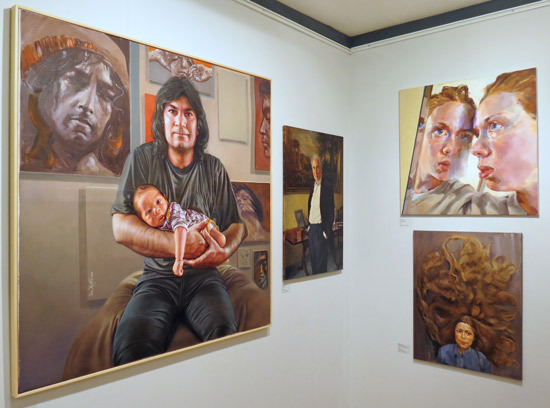 I know I was looking for the knockout portrait - and didn't find one - apart from prizewinners. However I did like those on the North Wall - they were much more interesting in terms of subjects, composition and colour. At the entrance there was a short run of four smaller portraits which made me linger. 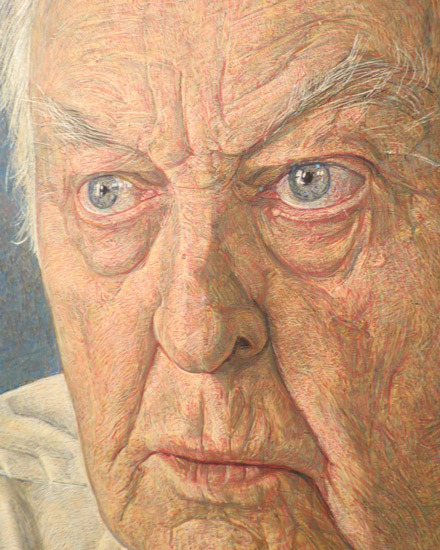 One of them was Anthony William's portrait of Sir Donald Sinden. I've been studying Anthony Williams paintings in egg tempera for years - the pattern of the mark-making is absolutely fascinating - and always creates a painting with impact and presence. All the more remarkable for so much of it being done from life. 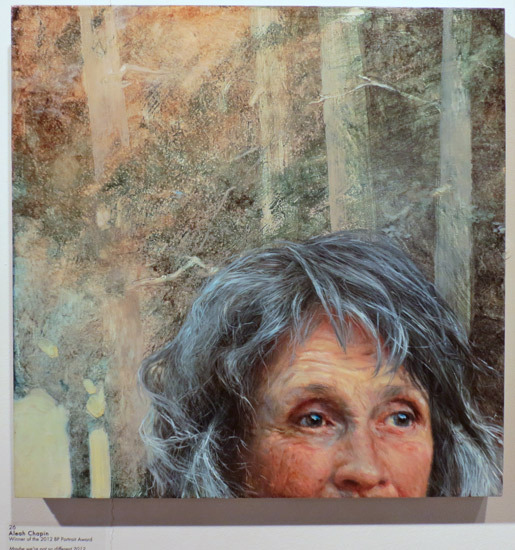 Full size painting: Egg Tempera 56 x 46cm, 22" x 18"
A painting by last year's BP Portrait Award Winner - Aleah Chapin - was also hung. I knew I was going to see her work again in the UK but hadn't anticipated quite so quickly as she's been having a very successful year since her BP win. It was also interesting to see self-portraits by RP members in the main gallery. 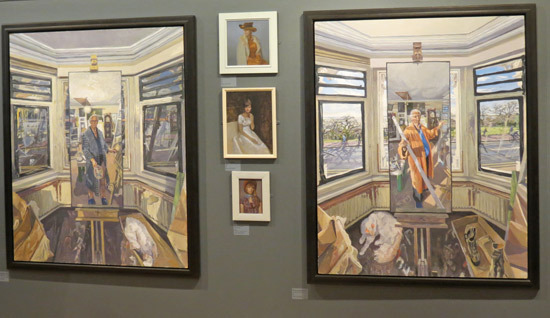 I loved the pair of self portraits by John Wonnacott CBE Hon. RP (In case you're wondering, he set up a mirror on an easel in front of a bay window). He does seem to be a portrait painter who is not satisfied with the ultra conventional (some of you may know him better as the portrait painter chosen to paint the Royal Family for the Queen Mother's 100th Birthday - 'Royal Family, a Centenary Portrait' which you can see in the National Portrait Gallery). 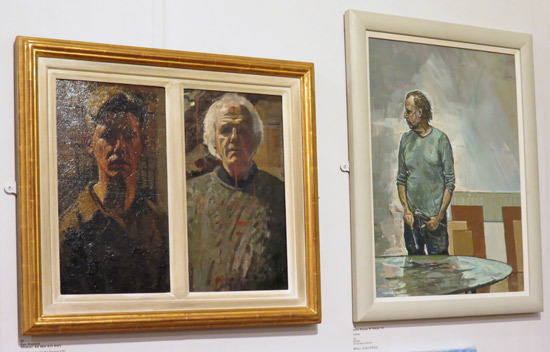 I was less wowed by the self portraits by art society luminaries Ken Howard and Jason Bowyer - but suspect that's the coloration of these portraits. 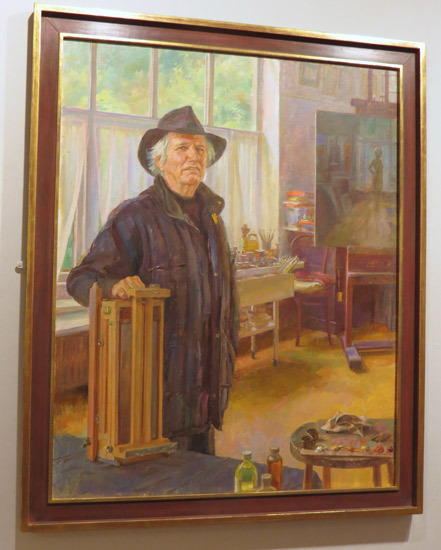 I preferred June Mendoza's portrait of Ken Howard. It said more about the man. The overall standard of portraits on display has always been high - however it seemed to me that the move to digital entry (introduced last year) and the new prize for self-portraiture this year had yet again upped the quality of the portraits in the exhibition. Work via the open entry was a very high standard. 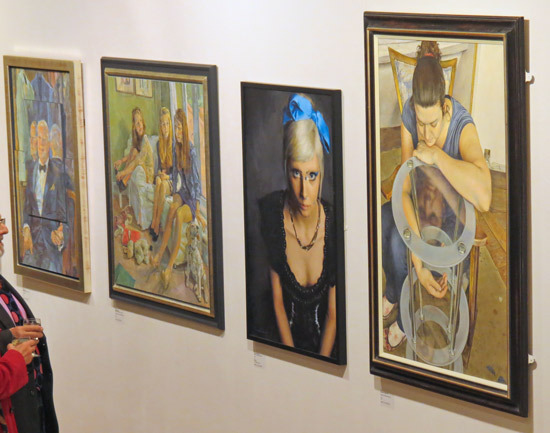 The exhibition continues until 24th May at the Mall Galleries. You can browse the paintings online - and also purchase online.